Recorded in sacred Sanskrit texts, including the Rig Veda and the Mahabharata, Hindu Myths are thought to date back as far as the tenth century BCE. 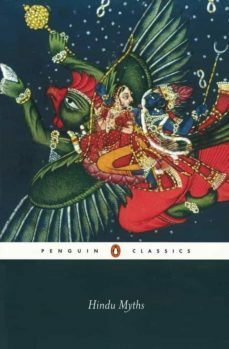 Here in these seventy-five seminal myths are the many incarnations of Vishnu, who saves mankind from destruction, and the mischievous child Krishna, alongside stories of the minor gods, demons, rivers and animals including boars, buffalo, serpents and monkeys. Immensely varied and bursting with colour and life, they demonstrate the Hindu belief in the limitless possibilities of the world - from the teeming miracles of creation to the origins of the incarnation of Death who eventually touches them all.